(This was copied from an email to all Goodall Homes employees, as well as our Vendors and Trade Partners on 2/5/12, by Keith Porterfield, COO of Goodall Homes). We are progressing well on Shaun Meadow’s home in Lynnville. I would like to recognize a few folks: Jackie Ricketts with RECS has installed the construction road and has electric, phone, and cable back to the house. Jay, with Southern Electric has set the temp electric pole and we have power! This was no small task. 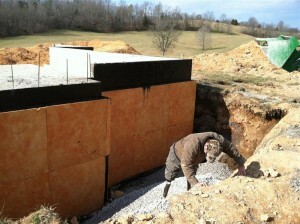 Thanks go out to Dave and Rick with JWC Foundations for getting the footings and concrete foundation walls poured. Also, great job on the concrete storm room. Thanks to Rogers Group (Devin Farmer) for their generous donations on the crushed stone and Mid South Concrete (Meredith) for her generous donations on the ready mix concrete. Thanks to Maron Sommers (Concrete and Masonry Shop) for hauling all the steel to Lynnville. Thanks to Edgar Perez for laying the block, and to Alley Cassetty for their donation of all block materials. I know I have forgotten someone; if so, please forgive me. Oh yes, Don for his work on backfilling the basement. And as always, LP Building Products for their continued generous attitude in this project. They are supplying structural components, osb, tech shield, Smart Siding, and, of course all the PR event coordination and funding. I’m very excited to be getting close to framing. Tommy Hutson (Hutson Bros Plumbing) will be out this week on the under slab work, as well as Jake Huckaby on the slab concrete. I would like for everyone on the job to meet Shaun if you haven’t already. His excitement and grateful attitude are contagious and a great reminder of why we are doing this. I was out there last week, and just watching Shaun, Nicole, and Treavor observing the construction process of their dream home was awesome!